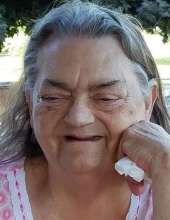 STEVENS, Irene Elizabeth - Age 73, of Flint Twp., died Thursday March 28, 2019. Funeral services will be held 3PM Wednesday, April 3 at Sharp Funeral Home and Cremation Center, 6063 Fenton Road, Flint. Pastor Brad Lake officiating. Visitation will be held 11AM until time of service on Wednesday. Those desiring may make contributions to the family or the Alzheimer's Association. Irene was born May 2, 1945 in Flint, Michigan, the daughter of the late Joseph and Evelyn (Tanner) Bukosky. She married William Stevens on December 28, 1985 in Durand. Irene enjoyed coloring and crocheting. Surviving are: son, Stan (Bobbie) Wood of Flint; daughter, Kristine (Jimmy) James of Flint; grandchildren, Brandy (Rick) Spivey-McGhee of Flint, Shelby Wood of PA, Elizabeth James of VA, Stanley Wood II of Flint, Amber Wood of Flint; many great grandchildren and several nieces and nephews. She was also preceded in death by her husband, William Stevens; son, David Wood; grandsons, David James and Jimmy James; sister, Virginia Aldrich and brother, Joseph Bukosky Jr. We would like to extend a special thank you to the staff at Kith Haven Nursing Home for her exceptional care over the last 6 months. Tributes maybe shared on the obituaries page of www.sharpfuneralhomes.com. To send flowers or a remembrance gift to the family of Irene Elizabeth Stevens, please visit our Tribute Store. "Email Address" would like to share the life celebration of Irene Elizabeth Stevens. Click on the "link" to go to share a favorite memory or leave a condolence message for the family.